We know that private school education is a significant investment for any family. 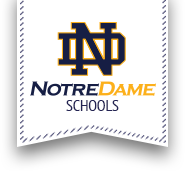 Notre Dame Schools are committed to providing access to all, we invest significant resources in our tuition assistance program to make Catholic education affordable. Our award program is need-based, so the greater the need the greater the award. If a student has a strong desire to attend Notre Dame, we will honestly do everything we can to make it financially possible. Notre Dame works with Smart Tuition, a tuition payment plan provider. All tuition payments are made through Smart Tuition, which offers families multiple payment options, from full payment to ten payments. Please click on the Application Forms Tab for tuition costs for the 2019-2020 school year. If you have any questions concerning tuition, please contact Laurie Cardone at (315) 724-5118, ext. 11.